Bet you’re surprised to hear from me again this soon. Me too. But I had an adventure, and you know me, I gotta write about it. I didn’t plan on going to Trader Joe’s today, but I did. I was supposed to be going for a job interview with a major hospital system here, for a job in Baytown. Guess what? Ten minutes into the interview, the guy said, “Oh, no! Who told you that? Oh, really? Oh, sorry.” After one curt comment without swear words, I picked up my stuff and left as fast as I could. Had I not done that, I would have let the entire floor know I was not happy with wasting my time going into town for no reason. In a suit. If you believe in angels, I think they’re pointing me somewhere. But that’s all I’ll say about that for now. Yes, I’m still in a bad mood. But I’m getting there. I had been thinking about a post-interview stop at Trader Joe’s on the way to town, since it was just a couple of miles away from the building I was in. I even brought a change of clothes so I’d blend in a little. Turns out I don’t blend in at the store in the Montrose area at all, that’s probably the main reason I prefer the store in The Woodlands. There’s nobody in The Woodlands with nearly floor-length red dreadlocks over the age of 65, not that I’ve ever seen. (It was a female.) But if you’re not in Houston, you might not understand that going to The Woodlands from the center of town would make for a very long trip home. 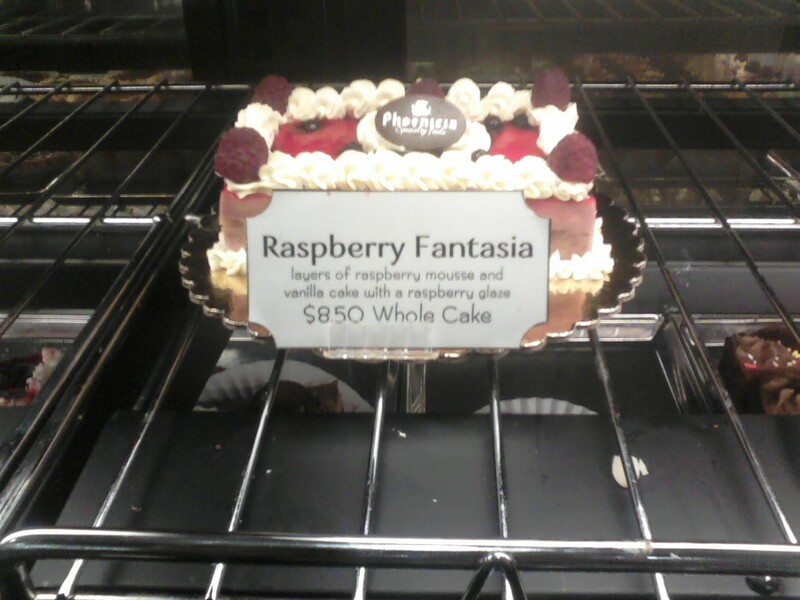 Oh, wait–I could have gotten a gluten free cupcake at Frost. AAAAHHH!! See? I told you I was in a bad mood. But I made it home safely, and didn’t have any crashes or “road rage” incidents, since I didn’t want to talk to anyone anyway. 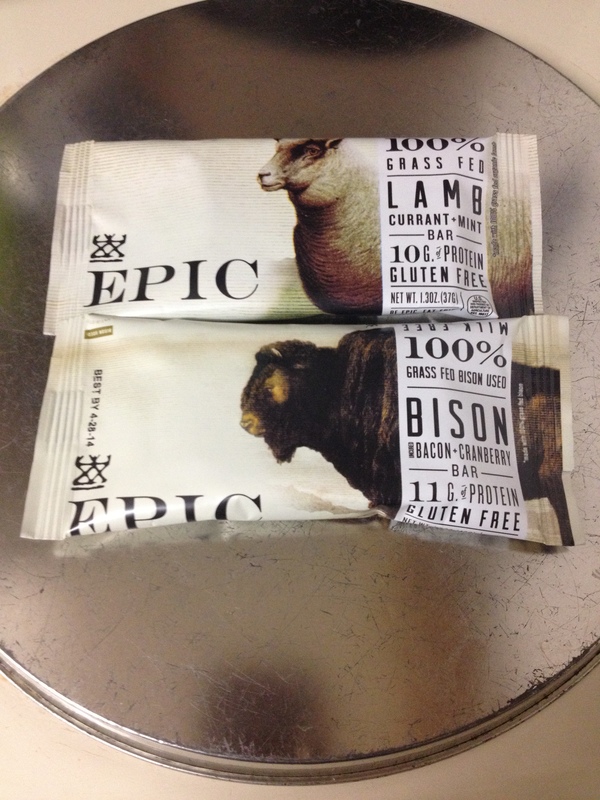 Bison and the new Lamb Epic bars. Delicious! Yes, it was quite tasty. Both the lamb and bison were fresh, since they were slightly moist, much like a Larabar would be. 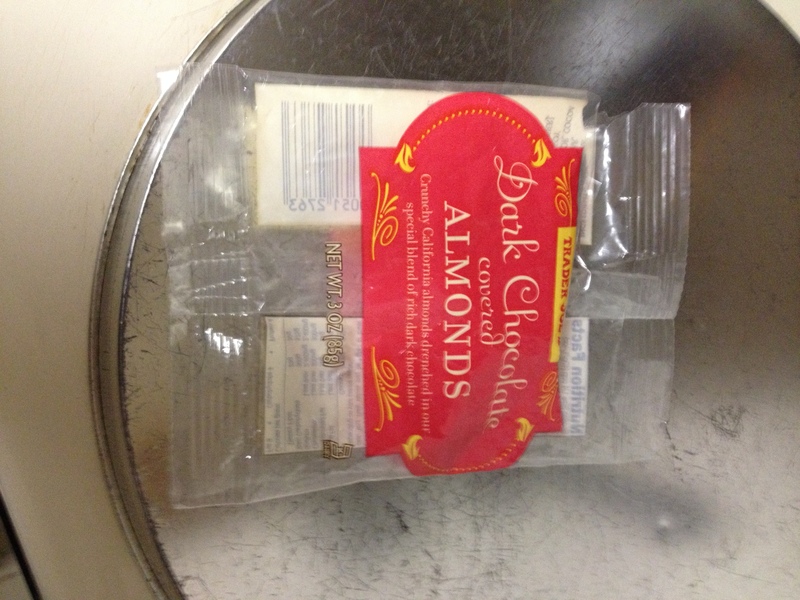 However, unlike Larabars, these have less than 10 grams of sugar, mostly from the dried fruit. Larabars, and Energetica’s other product, Thunderbird bars, are all dried fruit with nuts, so they have much more sugar in them, and fat from the nuts. However, I know that some folks are not wild about mint, so if you’re one of those, avoid the delicious new lamb bar. 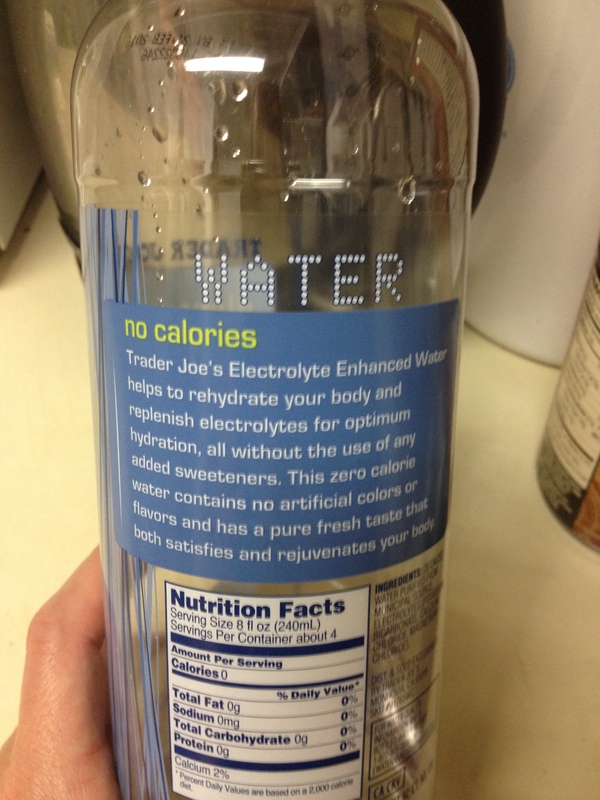 Magic water enhanced with electrolytes. Because I was really thirsty. Their regular bottled water is 17 cents a bottle. 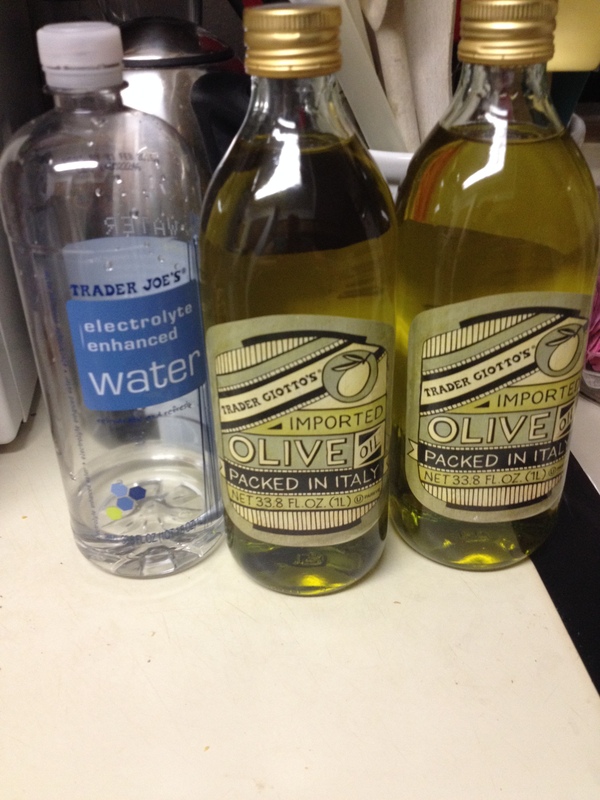 However, this was a bigger bottle at 99 cents, and since I was going to have two Epic bars, I needed plenty of water. 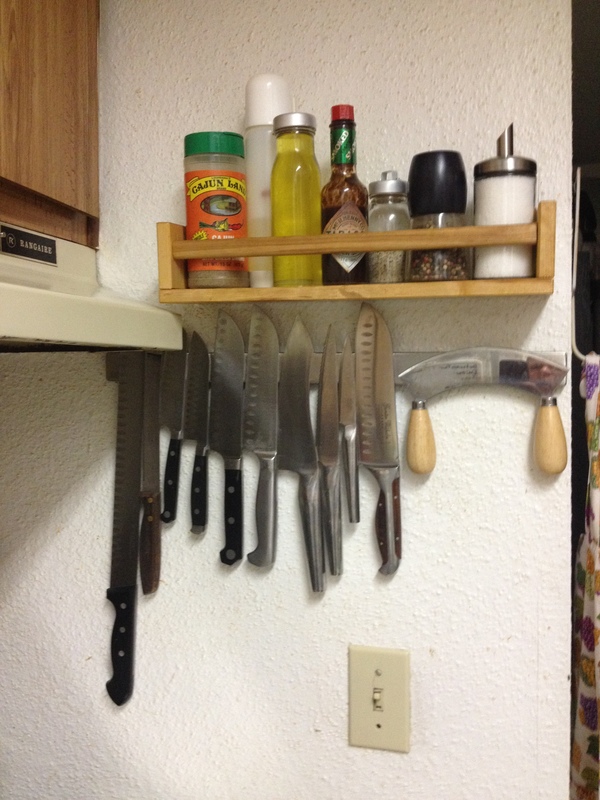 I may have shown you this before, but I have a shelf hung by the stove, with a knife bar underneath, to make the heavy-duty cooking easier. I refilled that little bottle with olive oil so that I can just use that instead of going to the pantry to get a bigger bottle and mess with that. Also, that’s a sugar shaker from IKEA with kosher salt in it. Easier than going for the square box, too. Salt, pepper, Chipotle Tabasco, olive oil, and some Cajun seasonings, along with the knives. Love them all! 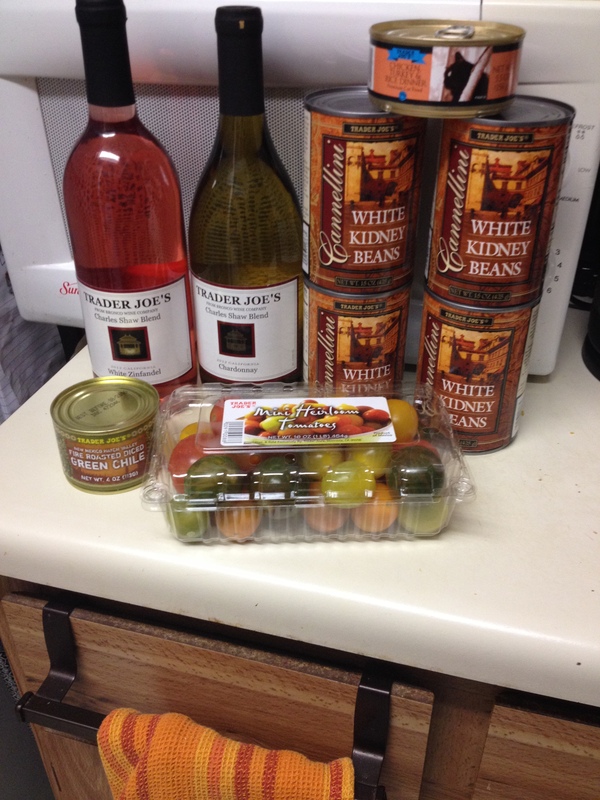 Canned beans at their best, with cheap wine! Yum. Now, that can of cat food on top the beans is a treat for the cat beast, and not included as part of any human food created or consumed in the HeatCageKitchen–despite the jokes I may make about doing such a thing on occasion. 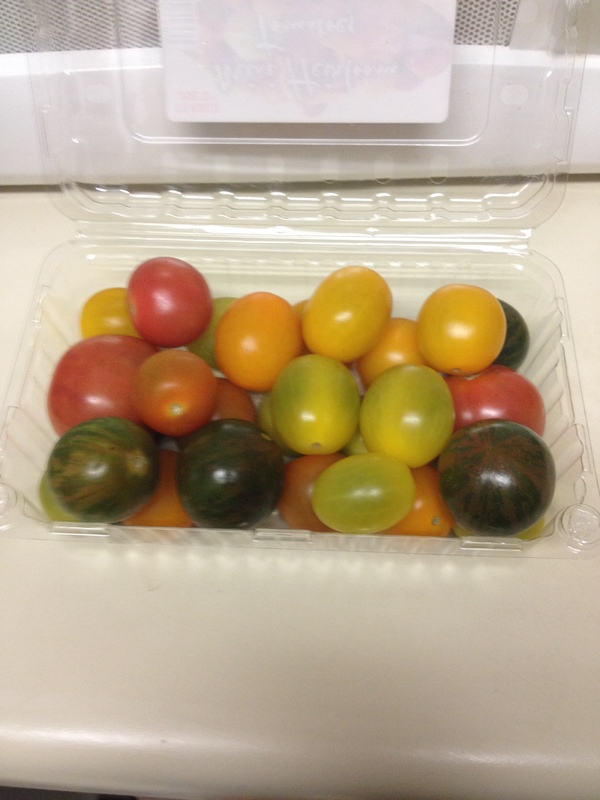 They taste as good as they look, honest. I don’t have them together, except in the freezer. The brie is just an incredible piece of cheese. Admittedly, those went into the freezer, because I could eat both the entire package of sausage and that 4 ounce round of cheese at once. OK, maybe half the cheese and two sausages today, the rest tomorrow. I found some of the sausages recently in the freezer and enjoyed them; this is just a replacement. Still, it’s really good, and both are the same price, $2.99. 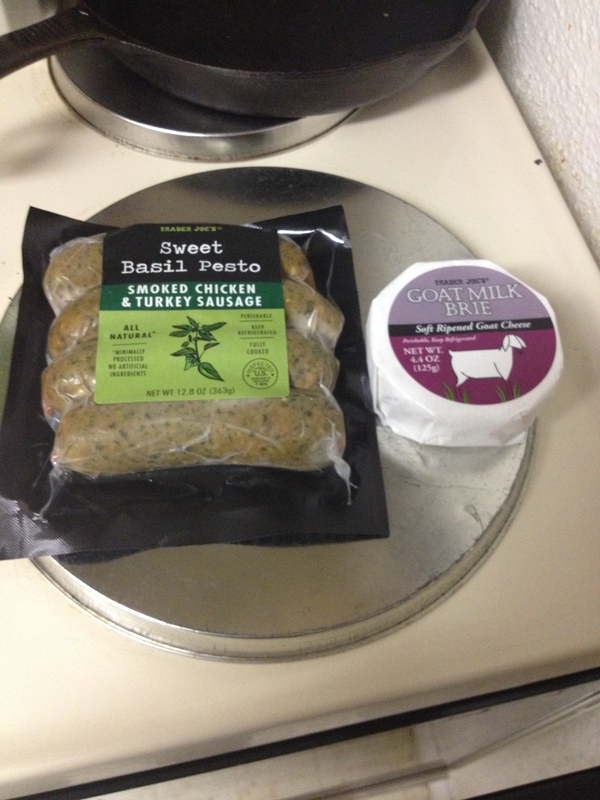 If you haven’t had goat milk brie, try it sometime–you’re in for a treat. I was going to buy some tahini, that sesame paste you make hummus with. Guess what? That little refrigerated container had. . .WHEAT! No joke. I thanked the man for finding it for me; he didn’t think twice when he said, ‘Oh, you’re looking for gluten free?” Yes. That’s the one thing nobody seemed to blink at. 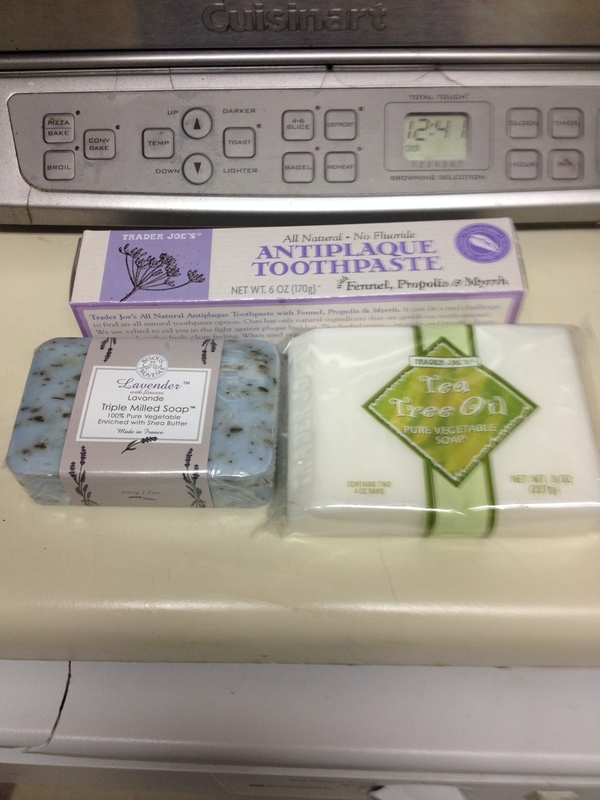 From the toiletries section, some lavender soap for my nighttime shower, and some tea tree oil soap just because it was cheaper and smells nice. That’s actually a package of two bars of tea tree oil soap, and all of their stuff is cruelty free, that is, not tested on animals. To me, looking at the cat beast sitting by the patio door, and thinking about all the little furry animals in the world, I appreciate that a lot. OK, so I took it by the toaster oven. I ran out of room by the microwave. This packet was 99 cents versus $3 for two Kind bars. One taste of Kind bars and you’ll understand why I grab two. I don’t know why the picture loaded up sideways. But I will tell you that there are two servings in that bag, and they were both delicious. Still,one serving has 13 grams of sugar, which is not bad for candy. Ice cream can vary from 19 to 30 grams of sugar, but you have to read the label. Yogurt with fruit on the bottom can run 40 grams of sugar for the little cup, all while being touted as “healthy.” Which would YOU rather have? All in all, I spent about what I’d get at HEB, although I just realized that my checker, “Matty,” neglected to ring up the 4 tins of Vanilla Mynts I put with my order, although I’m not sure why. I have some for now, I’ll just get more another time, I guess. Well, anyway, I’ve got that out of my system, and I’ll have a couple of gluten free stories coming soon. And a cookbook review if I think about it.